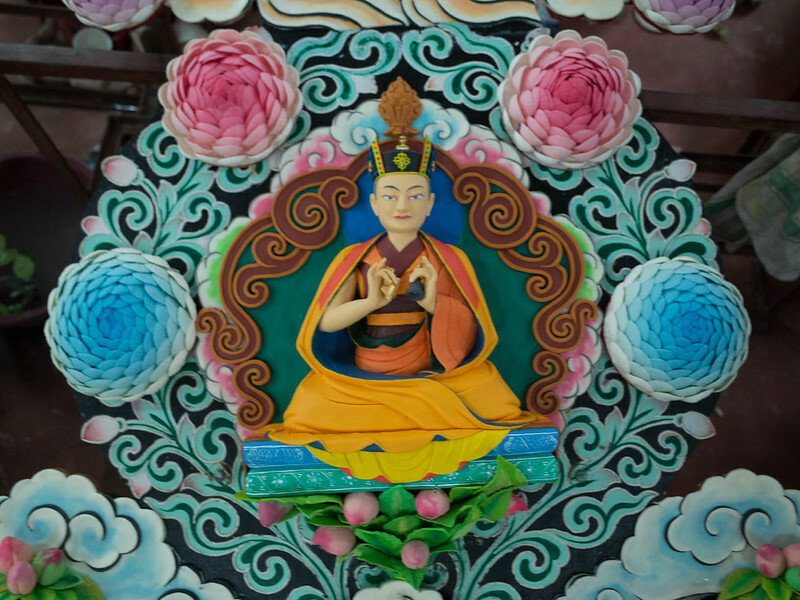 A special feature of the annual Kagyu Monlam are the elaborate butter sculptures designed by the 17th Gyalwang Karmapa, Ogyen Trinley Dorje. These beautiful tormas were featured in the documentary, Torma: the Ancient Art of Tibetan Butter Sculpture, completed in 2014 under the guidance of His Holiness. The film highlights the extraordinary level of craftsmanship that goes into creating the wax butter sculptures. Even though butter sculpture exists in other cultures, the Tibetans have taken the art form to dizzying heights. 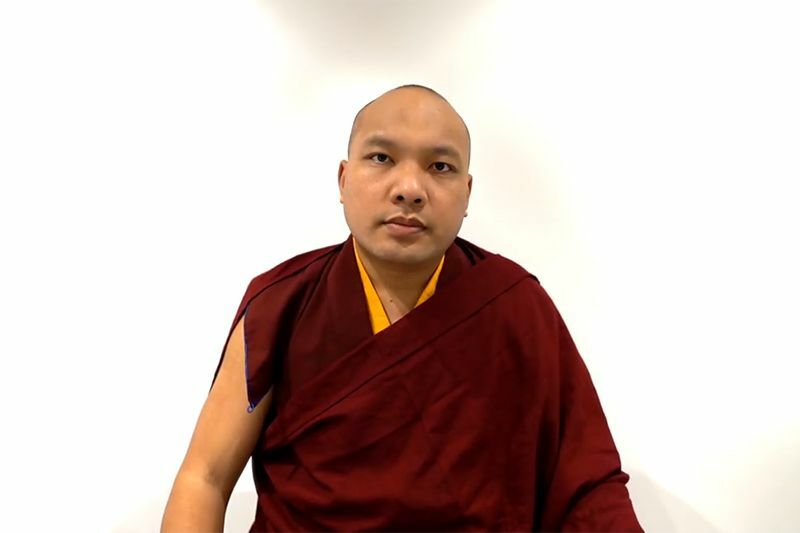 Long before the Karmapa took over direction of the Monlam in 2004, he had begun reviving the Kamtsang traditions of Marpa, Mila, and Gampopa. 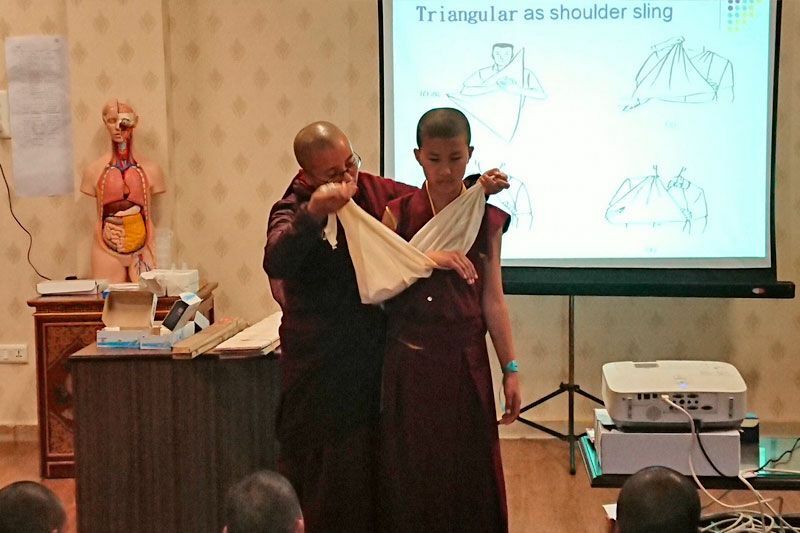 The Kamtsang tormas were one of the many traditions he set about revising. 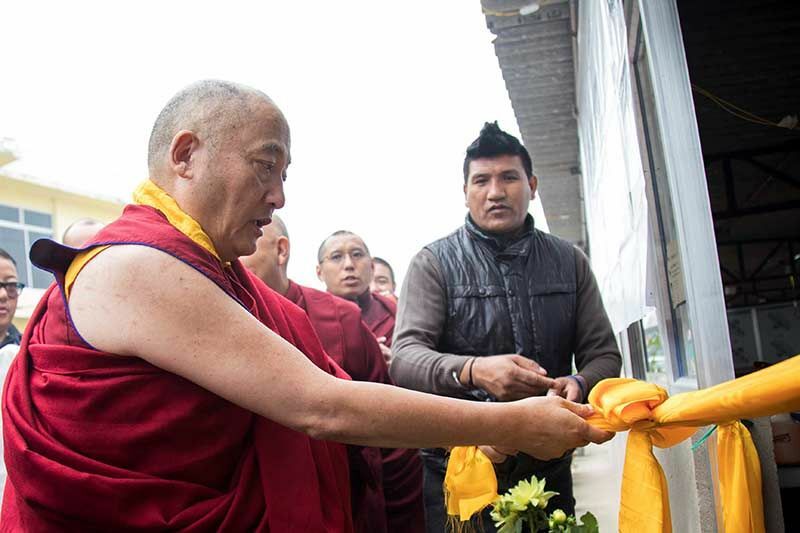 The first tormas he designed for the Monlam in 2005 honored the founding Karma Kagyu masters, but in subsequent years, he has expanded the subject matter significantly. 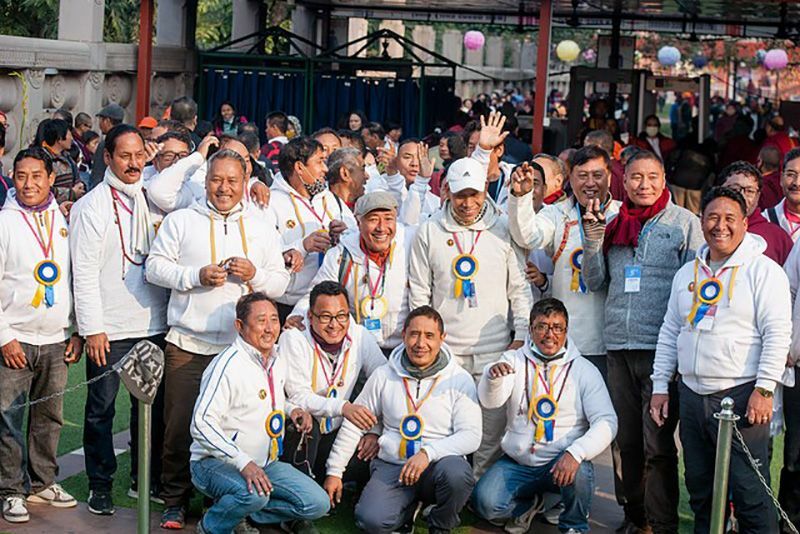 Each year he chooses a different theme, but the same six torma supervisors return to train the aspiring junior artists: monks and nuns culled from Karma Kagyu monasteries and nunneries throughout the Himalayan region. This year there were 65 artists working in total: 53 monks and 12 nuns. They began on January 24, 2017 and finished just in time to set up the three-tiered altars for the first day of the Monlam. The altars span the Pavilion stage and are notable for their simplified elegance. There are eight large tormas, four on the left and four on the right, with three main sections each.The butter sculptures reside on the upper tier of the shrine, flanked on either side by red and yellow flower arrangements in golden vases. On the middle shelf are the shalzes, impressive with their sculpted ornaments representing the eight auspicious substances, the eight auspicious symbols, and the seven articles of royalty. Each shalze sits on its own carved, wooden stand. On the bottom shelf of each shrine are seven, large ornate bowls filled with offering water. 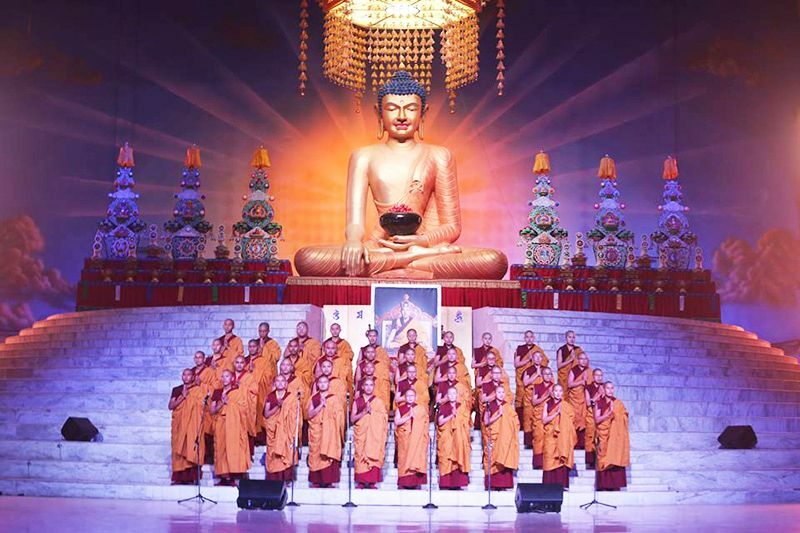 The central theme of this year’s tormas are the first eight Karmapas; their depictions run across the center. On the upper level of the tormas are the Gyen Truk Chok Nyi (the Six Ornaments and the Two Supreme Ones). The six ornaments are: Nagarjuna, Aryadeva, Asanga, Dignaga, Vasubhandu, and Dharmakirti; the two supreme ones are Shakyaprabha and Gunaprabha. Across the bottom section of the tormas, are representations of eight kings: the Four Guardian Kings, and the Four Mountain Kings of Tibet. The Four Moutain Kings of Tibet are the powerful, fierce protector gods associated with famous moutains in Tibet. In the East, in Amdo is Majel Pumra; in the West is Nyenchen Thangla, in the South in southern Kham is Yejel, and in the North in northern Kham is Jogchen Dongrel. The worship of mountain gods was one of the most important forms of nature worship among ancient Tibetans and has continued to the present day. Here, the torma artists have done justice to their haughty magnificence. These eight tormas exhibit museum quality artwork but will most likely be destroyed at the end of this year’s events, a powerful reminder of the impermanence of all conditioned phenomena.